Hello there! I'm HareTrinity and this is my very first time writing for this site. The plan is for me to start posting reviews of non-Filly animated series, episodes, and films featuring prominent fantasy equines, but this first article will instead be about legendary horses. Now, you're likely familiar with today's fantasy equines having horns and/or wings, but how much do you know about the mythology and folklore behind these creatures? Do you want to know about the gory origin of Pegasus or man-eating equines of legend? Join me after the page break for a brief overview of a few striking examples of legendary equines and, as I'm posting on Halloween night, expect some unfriendly horse beasts! Hello everyone! It's now been a week since we started running daily updates (which we will keep doing for a limited time), and a week and a half since the end of MIPCOM. 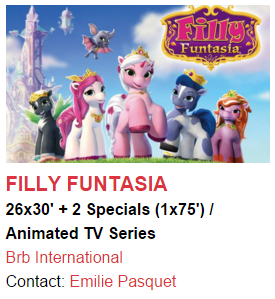 At this point, the assumption that we're not getting any Filly Funtasia news out of MIPCOM this year is a fairly safe one to make. So let's do something different, yet again. In about a week from now, me (that's Skundi) and Zejgar will be holding a long discussion where we go over the current situation, what we think could happen in the future, and what our plans for this website are. We also want to take that opportunity to answer any questions and discuss anything you feel should be discussed! Whether it be something about this site itself, or something about Filly/Filly Funtasia (we do know a few things about it by now!) or something else you want to know about or feel should be discussed - we'd like to take the opportunity to talk about it. You can either leave the questions or discussion topics here in the comments, through Twitter (@funtasiadaily), or by email ([email protected]). Thank you! We continue our journey through the core toy lines of Filly in this sub-series of the Fill(y)ing You In series! Last time, we looked at the very first toy lines: Forest, Beach Party, Princess and Fairy. What unites these four lines is the element of realism, which, to be fair, weakens as the series goes on. 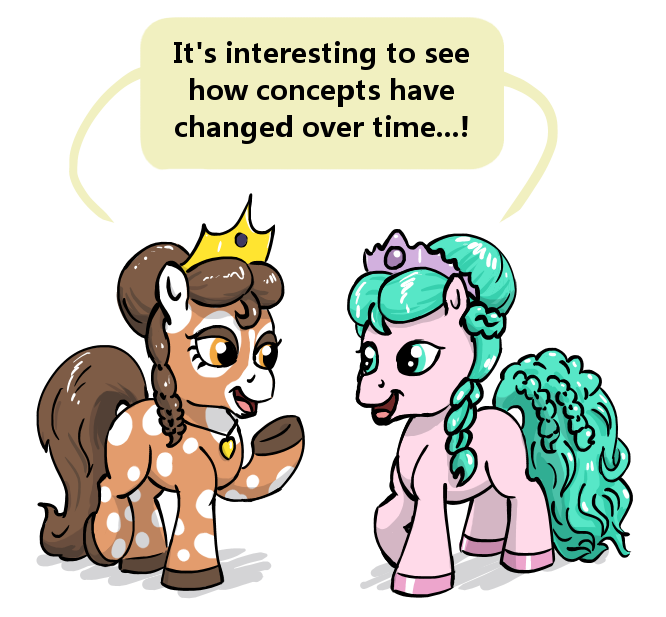 The toy lines we will take a look today, while not being the most recent lines in the series, encapsulate what the Filly toy series are about to this day - this is the evolutionary plateau of the toy lines to this day, in many ways. Welcome to the second installment of the "Fill(y)ing You In" series, a series dedicated to exploring various aspects of Filly! In this article, we will begin exploring the toy lines that form the core of Filly. Filly has gone through a lot of incarnations over the past ten years, losing and gaining elements along the way, so looking at all of them may take some time. This article covers the lines that jump-started the series in the very beginning. Let us dive right in! This arrangement was created by Ethan Toavs, who also does a lot of neat MLP G3 arrangements among other things - check out his YouTube channel for more! MIPCOM has always been the time of the year when we get new Filly Funtasia video content. In 2013, we got the very first promo, which led to the creation of this website. In 2014, we actually got to release their new teaser before anyone else, and in 2015, we got a new promo featuring the catchy "Magical World". The 2016 MIPCOM reel is out on BRB's YouTube channel, and... there's no Filly Funtasia to be seen. Let's get to the bottom of this. It's October! The time of the year when we get new Filly Funtasia videos! And this video we're about to show may be new to us - but it was actually released back in July 2015 (Before Promo 5!) on a Chinese video site and never before seen on the English-speaking internet. In addition to a wide range of collectible figurines, plush toys and miniature plastic architecture, the Filly brand possesses a number of digital applications. So far all of them are made for mobile devices, and for the most part they are quite simple: collections of biography for each Filly, minigames where the player is supposed to draw the characters, the ability to add frames and various objects to the photos taken by the device's camera - features that define entertainment, but not games, strictly speaking. However, there are two mobile Filly applications that differ from the rest: they feature actual challenging gameplay. The names of these applications are Filly Cupcake Shop and Filly Witchy's Witchy Adventure. The subject of this article is the latter one, since there is quite a lot to say about it. The specials take place in the Academy. Of course, the authors of that short article are not BRB themselves, and so there is still room for the possibility that these details may not reflect reality. We'll see! 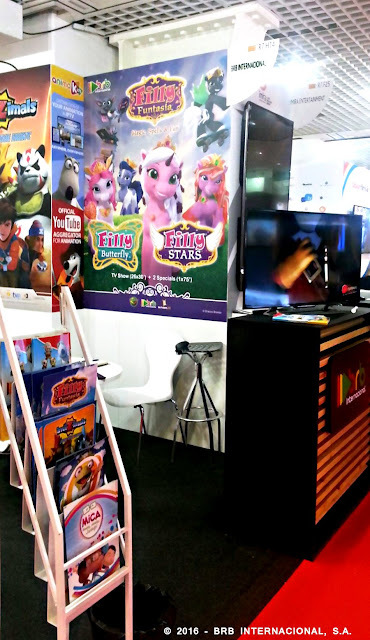 The photo shows a part of BRB's booth and, specifically, a large Filly Funtasia poster. The bottom of the poster shows the already known combination of 26 episodes and 2 specials, but slightly above it are two new logotypes that read "Filly Butterfly" and "Filly Stars", both in the same style with the Filly Funtasia logotype! Those are probably the working titles (or even the final titles) of the two specials. 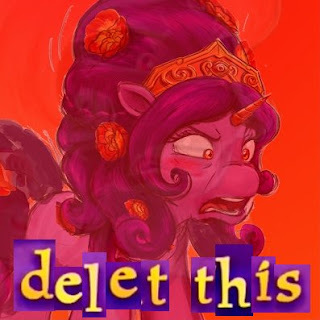 We have already seen Butterfly-related content in the concept art, but this is the first direct mention of Filly Butterfly in the context of Filly Funtasia. 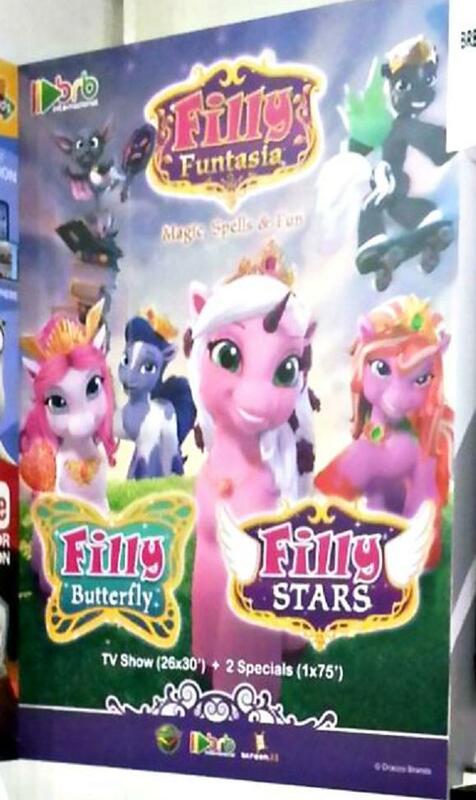 With this, Filly Funtasia finally covers all primary toy lines from Filly Fairy all the way to Filly Stars, with Filly Princess and Filly Royale still in question. The defintion of "primary" may vary from person to person. TWO Filly Funtasia Movies Coming? MIPTV is here, and Catalan Films & TV have released their lineup of shows and movies (through their newsletter) that'll be promoted at their stands. Filly Funtasia is represented there as always, but there's something new to catch my eye in its listing. Yep, they're listing two 75 minute specials! 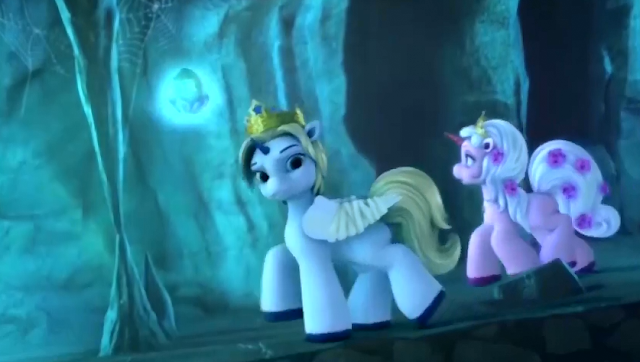 Now, we've already seen hints that there's going to be a Filly Funtasia movie of some kind as well as a show, but this is the first time I've seen anything that suggests there'll be more than one. I can't help but be reminded of another BRB production, Invizimals, where they launched the both series and two TV Movies almost simultaneously. Whether this is their plan for Filly Funtasia as well remains to be seen! In one of our previous articles, we have mentioned a lot of Filly toy lines, including Princess, Fairy, Unicorn, Elves, Witchy and Stars. However, as many Filly fans should already know, the spectrum of Filly toy lines includes many more than just the aforementioned six series. To learn more about how Filly Funtasia will handle the lore of Filly, we have gone to the depths of the HFDL offices and met with the official spokesmen who were glad to share information with us. Luckily we were allowed a limited use of our camera, and thanks to that we were able to record the interview. Check it out by clicking "Read more". The official Filly Funtasia website was updated yesterday to include an additional button in the top row. The already existing "About Funtasia", "Characters" and "Locations" buttons have been joined by a peculiar new button which simply reads "Offer". Clicking the button will take you to a new page, where you will be presented with a list of all 26 episodes of Filly Funtasia (complete with title and synopsis for each episode! ), with some additional info. Looks like they are already starting to work on the distribution of the show! If you have spare money, you can buy all of Filly Funtasia and watch it before anyone else. The whole 26 episode package seems to cost 181.74 EUR, which is quite a lot of money, at least for me. Unfortunately clicking "Preorder" redirects you to the home page of the website. 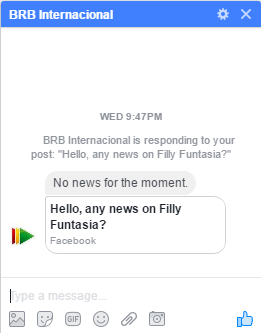 I guess the service isn't working yet, but it's really important to keep an eye on this chance to see Filly Funtasia early. Also, the preorders seem to affect the release date of the show, so, please, spread this information around! 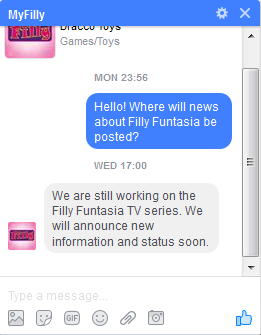 The more people preorder Filly Funtasia, the earlier we'll get the show! And since it's been delayed who knows how many times already, it's a big deal. EDIT: turns out one of the episodes has been leaked via Dailymotion! By the looks of it, it's still not complete - some scenes lack proper animation and the voice acting is most likely a placeholder, but the story itself is intact.